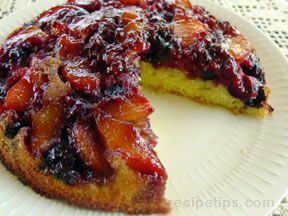 This attractive cake can be made with many different kinds of fruit. Experiment with whatever is in season. Melt 3 tablespoons butter and 1/3 cup brown sugar together and pour into 9 inch pie dish (or put both in dish and melt in microwave). Peel and slice 2 peaches or nectarines and arrange in the dish. Strew raspberries and blueberries over the slices. Set aside. Make the cake batter: cream butter and sugar together until smooth. Add egg and mix in. Mix in milk and vanilla. Mix together flour, salt and baking powder, then stir into batter. 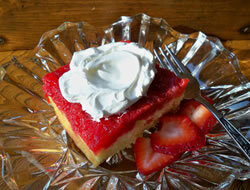 Smooth batter over fruit and bake until a toothpick inserted into the center comes out clean, about 35 minutes. Cool on a rack for about 10 minutes. 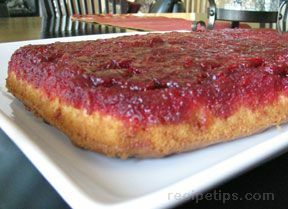 Run a knife around the edge to free it, then, while the cake is still warm and before the fruit has started to firm up, put a plate (somewhat larger than the baking dish) on top of the baking dish and turn both upside down. Needs no frosting. TIP: If the fruit doesn't come neatly out of the baking dish, heat remnants a little to soften them (microwave is useful), then reassemble on top of the cake. It will be delicious even if it doesn't look perfect.